Wm. 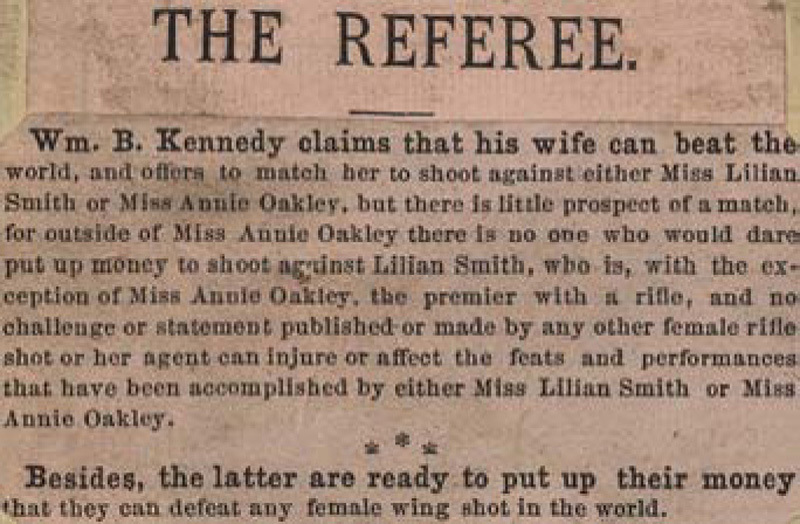 B. Kennedy claims that his wife can beat the world, and offers to match her to shoot against either Miss Lilian Smith or Miss Annie Oakley, but there is little prospect of a match, for outside of Miss Annie Oakley there is no one who would dare put up money to shoot against Lilian Smith, who is, with the exception of Miss Annie Oakley, the premier with a rifle, and no challenge or statement published or made by any other female rifle shot or her agent can injure or affect the feats and performances that have been accomplished by either Miss Lilian Smith or Miss Annie Oakley. 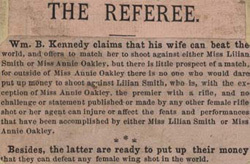 Besides, the latter are ready to put up their money that they can defeat any female wing shot in the world.